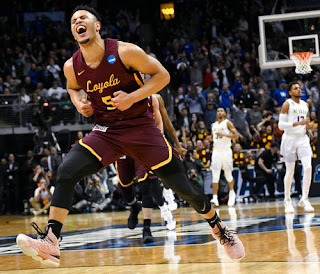 With Loyola-Chicago's captivating NCAA Tournament run hanging in the balance, it was Marques Townes' turn to deliver another memorable finish. 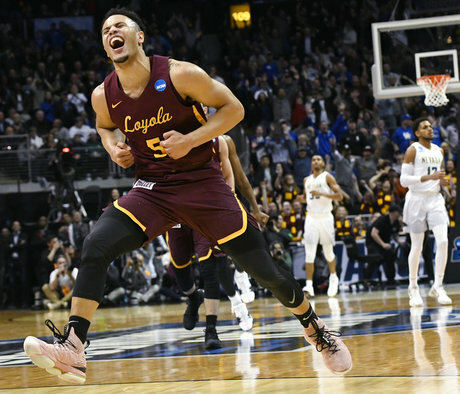 Townes had scored only a combined 15 points in Loyola's first two NCAA Tournament games, but that didn't concern Ramblers coach Porter Moser. Townes had the ball in front of the Loyola bench in the final seconds Thursday night and the shot clock about to expire. "He was a warrior," Moser said. Following a timeout, Nevada's Caleb Martin answered with a 3, but this time the Wolf Pack couldn't extend their string of second-half comebacks in the tournament. The win leaves the No. 11th-seeded Ramblers, the biggest surprise in a regional that has lost its top four seeds, one victory from a Final Four appearance. Loyola (31-5), which has won three tournament games by a combined four points, awaits the winner of the Kansas State-Kentucky game in Saturday's regional final. Loyola trailed by 12 points, at 20-8, midway through the first half but stormed back to lead 28-24 at halftime. Loyola closed the half with a 20-4 run as Nevada didn't score in the final 7:55 before the break. Loyola pushed the ball in the paint on almost every possession. The Ramblers' first 10 points came on layups. Loyola's relentless attack on the basket continued as it stretched its lead, one layup at a time, in the second half. Nevada: The Wolf Pack couldn't keep pace with Loyola's inside attack. They made only 8 of 27 3-pointers. Four members of Loyola's famous 1963 NCAA championship team had front-row seats: Jerry Harkness, Les Hunter, John Egan and Rich Rochelle. In the final minutes of the game, Harkness could be heard saying, "We need a stop. We just need a stop." Also attending the game was Sister Jean Dolores Schmidt, Loyola's 98-year-old team chaplain who has become a celebrity during the tournament. "It was getting pretty bad. I thought I might have to resort to my nitro (nitroglycerin), but I didn't have to do that," she said after the win. She also had a word of caution for Loyola's next opponent: "Here we come, next team, whoever you are." Nevada's experience in second-half comebacks paid off. After Loyola's layup by Custer gave the Ramblers their last 10-point lead at 57-47, the Wolf Pack charged back. Cody Martin's basket started a 12-2 run, and his layup tied the game at 59-all with 4:06 remaining. This time, however, Nevada couldn't regain the lead. Loyola: The Ramblers will face the winner of Thursday night's Kansas State-Kentucky regional semifinal in Saturday's regional final. 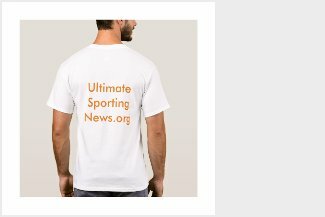 Nevada: Despite losing four seniors, the Wolf Pack again will be a team to watch in the Mountain West. Among the top returning players will be the Martin twins, who are juniors.